It is made from cedar strips from nafco (home depot) and bolted at the junctions. Extremely sturdy. 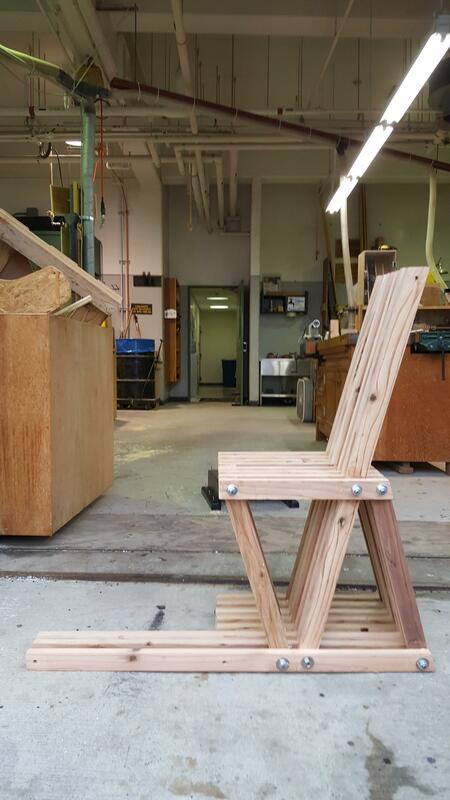 Will add plywood to the seat since cedar is soft. The long strips at the left are for a footrest, height to be determined. Suggestions? I am a 5'7" guy. How high are your footrests? The seat is not very deep. No purpose in kicking back and relaxing in this! It is a guitar playing stool. Ergonomically where would you put the backrest to force straighter posture? At the small of the back; at the shoulders-- both? This is a very interesting design. Have you completed it? I think foot rest height is an individual thing. If you put some notches in the long pieces you have extending on the left - you could make the foot rest adjustable. I think I will build one!!!!!!!!! Most interesting indeed. I like a padded seat. Maybe if so inclined yourself, you could just buy a seat pad and use as is? You could make an adustable backrest with supports that slide between the slats. The lumbar region.